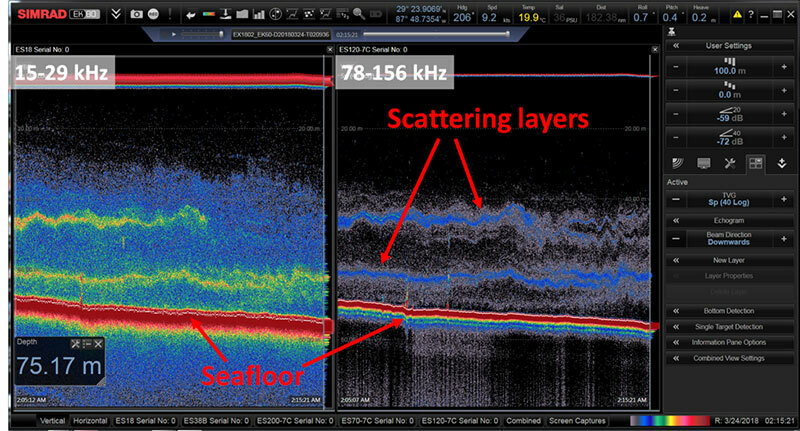 During expeditions on NOAA Ship Okeanos Explorer, we continuously collect acoustic data with our sonar systems. In addition to mapping the seafloor, the data provide information from the sea surface to the seafloor, in a region called the water column. Data from the water column allow us to observe fish, congregations of plankton1, and other organisms. Under the right conditions, we can also use the water column sonar to see the boundaries between different water layers in the ocean2. Throughout the Gulf of Mexico Technology Demonstration, we are using a new type of fisheries research sonar to visualize the underwater world in better resolution than ever before. Figure 1. Water column sonar data from a shallow region (75 meters or 246 feet deep) in the Gulf of Mexico. Several scattering layers can be seen in the water column in both frequency ranges. 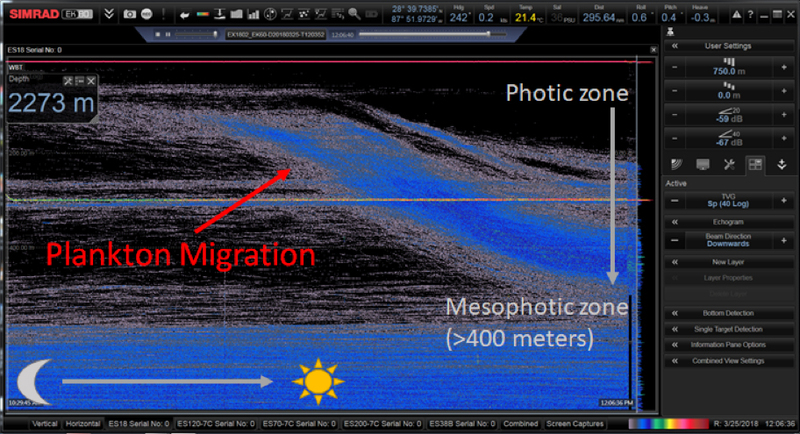 Scattering layers can result from congregations of biology, such as fish or plankton, and/or changes in water properties. Image courtesy of the Gulf of Mexico Technology Demonstration. . Download larger version (jpg, 639 KB). The new sonars, called wideband split-beam echosounders, collect data over a broad range of frequencies, allowing us to distinguish between objects in the water column with more clarity and confidence. The Okeanos Explorer is presently operating two of these new broadband sonars, one operating from 15 - 29 kHz and the other from 78 - 156 kHz. Higher frequencies, such as the sonar from 78 - 156 kHz, provide high vertical resolution but are quickly absorbed by seawater, meaning we get data only to about 200 meters (about 656 feet) below the surface. On the other hand, lower frequencies, such as the sonar from 15 - 29 kHz, can reach deeper depths, tracking the seafloor down to more than two miles below the surface, but do not provide the same level of resolution. With the lower resolution, it cannot distinguish the smaller animals that the higher frequencies can. Using high and low frequency ranges together gives us the best of both worlds: we can track individual fish and plankton layers in the shallow water column (less than 200 meters or 656 feet), while simultaneously tracking other organisms in the deepest part of the Gulf of Mexico (greater than 1,500 meters or 4,921 feet). Continuously collecting water column data provides us a real-time view of many different types of ocean processes. The image below shows the dramatic daily vertical migration (diel vertical migration) of micronekton, the largest migration of animals in the world3. In the image below, micronekton are migrating just before dawn from shallower waters, where they feed at night, to deeper and darker waters where they avoid predators during the daytime. Figure 2. Organisms migrating to deeper in the water at dawn. Image courtesy of the Gulf of Mexico Technology Demonstration. . Download larger version (510 KB). Do different species of plankton exhibit different daily migration behavior? How do different water masses (e.g., fresh Mississippi river water and salty Gulf of Mexico water) interact across space and time? What are the limits of this technology to differentiate between species? While these sonars were originally developed for fisheries research, this new technology has opened new windows for us to observe many other aspects of the waters beneath us. The data we collect during the Gulf of Mexico Technology Demonstration will help us to better resolve the dynamics of our ocean and drive us to ask new questions we have not yet considered. 1 Stanton et al. 1996. Acoustic scattering characteristics of several zooplankton groups. ICES Journal of Marine Sciences. 53: 289-295. 2 Stranne et al. 2017. Acoustic mapping of thermohaline staircases in the Arctic Ocean. Nature Scientific Reports. 7: 15192. 3 Hays, G. C. 2003. A review of the adaptive significance and ecosystem consequences of zooplankton diel vertical migrations. Hydrobiologia. 503: 163-170.